Futons has a full spectrum of advantages that usually comes handy, especially when you dealing with limited space or need to create an extra sleeping space. They are well known for helping space-saving properties. However, when the word “Futon” is heard, what comes in mind first is a piece of furniture that can be used either as a couch or sleeping surface. In the day, it is often used as a sitting area or crouch, while by night, it is folded down to provide you with a sleeping surface. It features a thick, cushioned mat for relaxation and comfort. A Japanese futon, traditionally known as a Shiki Futon or Shikibuton, uses a similar concept to the typical Futon. It provides you with a chance of maximizing your sleeping space. However, it is not the same as what you probably know futon to be. It slightly differs in construction and style, which makes them more versatile, unlike its framed, bulky counterparts. No doubt, you might have overheard the term, and you ask yourself — what is a Japanese Futon? Here is a detailed explanation of the space-saving product. Shiki Futons comes in a slim, rectangular and foldable design. It is filled with cutting batting, which gives the cushion support and comfort needed to have a sweet night rest. Several Japanese Futon products are flooding the market, and they are usually thinner than our contemporary foam-filled futons cushions. They are available in different bed sizes to meet various individual’s needs and modern convenience. It is often 3 to 4 inches high from the ground level. The futons can serve as a sitting mat or lounge against by just folding it. They are designed to be easily folded and stowed away. However, traditionally, Japanese futon is meant to be placed on the floor rather than on furniture. However, it is not placed directly on the floor but a woven Tatami Mat. For centuries, most Japanese homes include an adequately laid out firm, well-cushioned tatami mat, which is made of rice straw and rush grass. Presently, modern Japanese homes do not automatically add this type of flooring. However, some still make use of tatami mats in between the floor and their futons. This flooring is essential as it provides extra protection and padding to your Shikibutons. Tatami mats are equally easy to roll and stow away and includes genuineness to your bedding set. Still, the use of the tatami mat is entirely by choice, and most of the Japanese futon sold on various online stores may not include this mat. Therefore, you may be required to purchase it separately. What is a Japanese Futon Made of? For the Japanese futon, the important thing is the mattress, which is called the Shikibuton. This futon is historically known to be stuffed with 100% cotton – both fill and cover. But modern models are available in a wide range of varieties using different synthetic materials; such as latex, foam, wool, and down the list. Although these new model are not considered the true Japanese futons, they may provide you with more support and comfort needed. Shikibuton: known merely as the mattress and may contain one or two futons. The Shikibuton – the term is coined from Japanese word hiku meaning to lay. The Shikibuton can include about one to two mattresses of varying thickness. If it consists of two mattresses, it can be about 6” thick. At the outset, Shikibutons was made with a standard size of nearly a twin bed, but at this moment, several products come with double that size. However, most people often recommend the twin size bed as it is made from cotton. The Shikibutons is available in several synthetic materials including foam, cotton, and wool. Kakebuton: this word is gotten from the Japanese verb to lay on top, Kakeru, which makes kakebuton a blanket, duvet or comforter. Also, it comes in various thickness and material which is dependent on temperature and season. It is often a bit larger than the shikibuton. The kakebutons is easy to wash regularly as it comes with a protective cover. Makura: this is a pillow. No doubt, the Japanese futon goes perfectly with any pillow desired including an ergonomic reading pillow. You may want to try out the traditional makura for the complete cultural experience. The makura is often small in size and firmer when compared to the typical pillows. It is filled with buckwheat hulls or beans. However, the market is filled with makura filled with other synthetic fillers. Creating a multi-purpose space since it can easily be folded or rolled up and stowed away in a closet. It is safe. The futon is very close to the floor. Therefore, there isn’t any pain even if you roll off the futon. Futons are super comfortable. 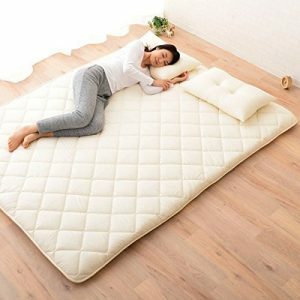 It is quite a cushion, and a firm mattress laid directly on the floor without the use of spring in between. No doubt, one can enjoy a nap or good night sleep. The rooms appear and feel larger. Since you would be sleeping on the floor, the room seemed spacious and occupied less space. The kakebutom’s weight in winter feels comforting. It is not too heavy, just appropriate to feel like a hug throughout the night. Appropriate for kids since they can’t break the bed. Boy can wrestle all day long without causing much damage. For individuals with small homes or need to create more space, Japanese futon may be just the perfect bedding for you. It is easy to roll up and store away somewhere without leaving your home design awful. It is great to have if you have to host a guest and there is no extra space for a bed. It works well for all room sizes and yet provides you with the same comfort and support any bedding can provide you with. Aside from that, Japanese futon is often said to help increase the quality of your sleep. Most people sometimes purchase one for better rest it offers, which is often deep and long, and, as such, increase your overall well-being and health.